As FLATSIXES.com is based in the United States, we admittedly don't follow 'proper football', known to us as Soccer, much. We do know, from watching several seasons of Top Gear, that Footballers tend smash up some very nice cars over in the Old Country. Young football players, especially the really talented ones, are paid quite well, and splurge on fast and fun cars that they may not be qualified to drive at or near their limits. Can we blame them? No way, we'd do the same thing were the cleat on the other foot. The difference, perhaps, is in using a bit of self control and common sense. Take Andre Wisdom, for example. Friday night, Wisdom's Porsche Panamera Turbo was lodged firmly in an unusually deep mud puddle. Andre, a new addition to the Derby County lineup on loan from Liverpool, and captain of the English National Under-21 team, was leaving his hotel room to head to the stadium for a game when he got very lost. After stopping for a beverage, Wisdom apparently input the address of the stadium into the Porsche navigation system. Whether he selected "shortest distance" or "fastest time" is unclear, but the SatNav directed the defender to turn down a muddy two-track road. Using none of the "Wisdom" his name might imply, Andre continued to follow the path for three miles, even as it became worse and worse. 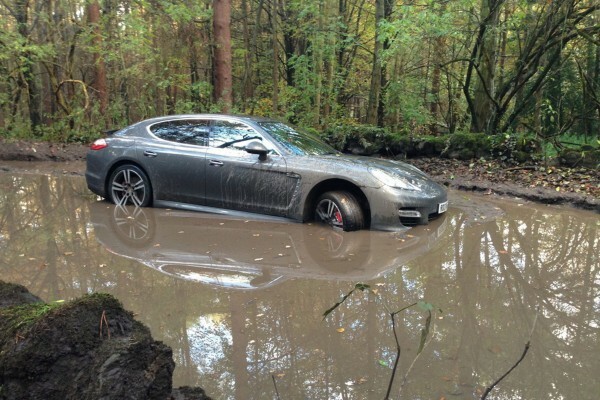 Instead of turning around, Wisdom, found his Panamera's all-wheel-drive system overtaxed by an absolute mud bog. Sinking down at least a foot into the mud, he was forced to abandon his Porsche there and call the football club to explain his delay. With some assistance, Wisdom was able to make it to the grounds in time to play in the match, but his Panamera has certainly taken on some damage. On Saturday morning, the car was found, still lodged deep in the mud, by a group of mountain bikers, who took these photos. The bikers called police to report the abandoned Porsche. It was later seen to have been extracted by a Jeep Cherokee, and reportedly drove away, but was smoking quite heavily. As much as I want to make fun of this chap, I know that I committed some similarly poorly thought out actions in my cars as a 20 year old. The difference here is that he is driving a Panamera Turbo, and is under the constant scrutiny of the English media, whilst I was driving a 15 year old Ford Crown Victoria, and was barely noticed by people I went to class with every day. Hopefully he gets his beloved Porsche back on the road and in tip-top shape in the near future. Methinks it speaks, in some part, about Porsche’s mapping software/GPS. I don’t even bother to use mine; it’s that pathetic.